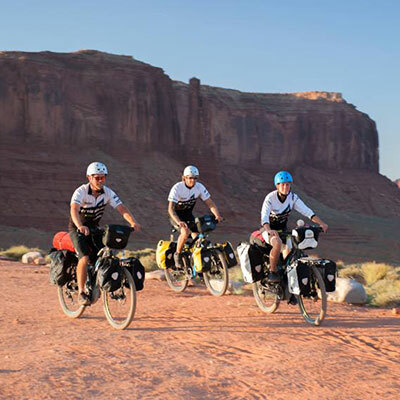 Under the Pedelec Adventures flag, Susanne Brüsch and her team travel the world on electric bikes and share their amazing experiences with the world – as an inspiration to discover new horizons, the very personal ones and the ones of our planet. Pedelec Adventures was born from Susanne’s experience and pioneer spirit in communicating new mobility in an international network, since 1997. In 2011, the widely published journalist, photographer and inventor of the word “pedelec” started developing, organising and riding multi-week adventure tours on electric bikes together with a specialist team. During tours through Morocco and Mongolia, (wo)men and material had to prove duress under stress, while solar-trailers served to re-charge the bike batteries. In 2013, the adventurers went on a 4,000-km challenge through Iceland’s northern beauty. This one-month trip was followed by the Berlin Trefected project showing that the adventure can start rigth at your doorstep, any day. With the start of E-Bike Africa, a planned 20,000 km journey from Glasgow to Cape Town, Susanne has given her work another dimension as she joined forces with the Scottish charity, The Purple Heart Network, to raise awareness of climate change. The epic traverse of Western USA with its stunning landscapes and extreme contrasts was the biggest adventure to date. The 5,000-km, 10-week Sand to Snow tour was meant to inspire people in a just evolving market about the benefits of electric bikes.